The summer plumage of the Black-winged Stilt is similar to the winter plumage except for variable black or grey markings on the head and neck. 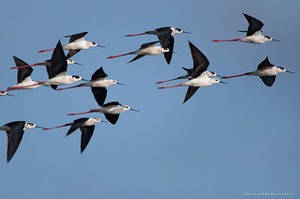 The extraordinary long legs of the Black-winged Stilt are particularly evident in flight. Note the variable amount of black on the neck and head of these birds. 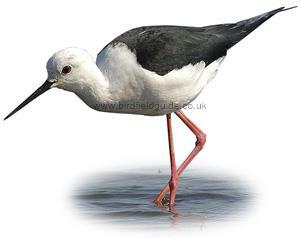 The Black-winged Stilt has long pink legs, black wings and a white body. In summer it has black or grey markings on the back of the neck and head. A widespread summer visitor to Southern Europe. 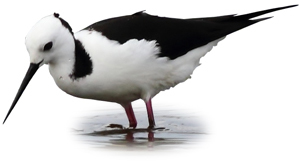 A very rare vagrant in Northern Europe and the UK. Has been known to breed in the UK. Shallow weedy pools, flooded pasture and rice paddies. The legs of the Black-winged Stilt are 32cm long and represent 60% of the birds overall weight. Black-winged Stilt flying and feeding, in summer plumage. 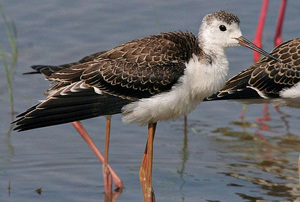 The juvenile Black-winged Stilt has pale edges to the back feathers which are browner than the adult. It also has white tips to the primary feathers which this bird is conveniently displaying.